Bucket operation 1 HP Motor. Material construction All contact parts SS304 and other parts of MS powder coating. NOTE: The technical specification of the machine may vary according to the customers requirement. *Number of buckets may vary depending upon level of elevation. The Sensograph’s Z Conveyor is an ideal solution for all the free flowing granules to move their product to a higher elevation. 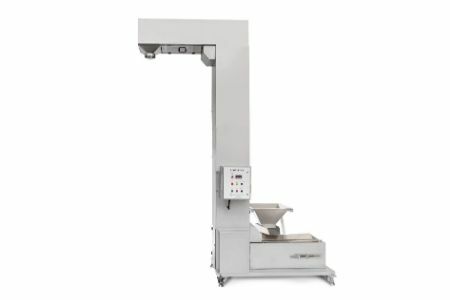 The machine contains Food grade buckets that lifts the material at the desirable height. Backed by rich industry experience, we are highly engaged in offering a premium quality range of Z Type Conveyor. Z Conveyor is checked on various quality characteristics so as to ensure that only best quality is delivered at client’s specified location. This product is designed using optimum quality material at our state-of-the-art manufacturing unit. Offered range is available with professionals in plethora of sizes, designs and specifications. This product is widely appreciated among clients owing to perfect finish and stylish quality approved. Offered range is acclaimed variegated clientele. Custom designed conveyor to meet your needs. Built from food grade materials. Buckets are specified to meet the needs of free flowing solid granules. Replacement parts are readily available. Heavy duty construction with M.S. Powder coating / SS Construction available. In house designed and developed.